Wink Wink Ink: Just an update & some new images! Just an update & some new images! Hello, friends! As you may have noticed, I have been MIA for awhile. I took an impromptu hiatus to be daycare provider for my 3 grandbabies for awhile. I had lots of good intentions to keep doing art and posting on this blog. "Oh, I can just do it while they sleep." I said. Yes, I am ridiculously optimistic. As it turns out, 2 year old twins and a 5 year old are really, really EXHAUSTING! The only one wanting a nap was Grandma! Even though it was hard sometimes, we made a lot of good memories and I'm lucky to have been able to spend that time with them. I miss the cuddles every day! The house we were living in also sold last Fall after 5 years on the market so I have been moving and getting settled in a new place. I'm still not unpacked, mostly because all of my stuff is stored in the garage and I nearly froze to death just looking for the Christmas decorations last month! (This is MONTANA, after all!) However, I've got my computer set up and I am able to get back to doing some artwork again! I've been taking some online art and design courses on Skillshare and I am in the middle of doing a complete overhaul on my store. I realized my photos were getting cut off on certain devices so it was time for an update. Gotta love technology and change! Anyway, I am still in the process of updating all of my listings so please excuse the mess! 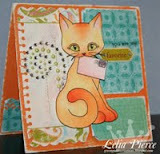 I am also adding some cards and other project ideas for each image to my listings. I hope they will give you some inspiration for using my images in new ways you may not have thought of before. 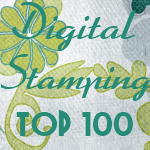 I know most people who buy my images use them to make cards but they are also great for printing your own stickers, iron-ons for clothing, and shrink plastic, making your own framed prints, or printing out for bored grandkids to color! 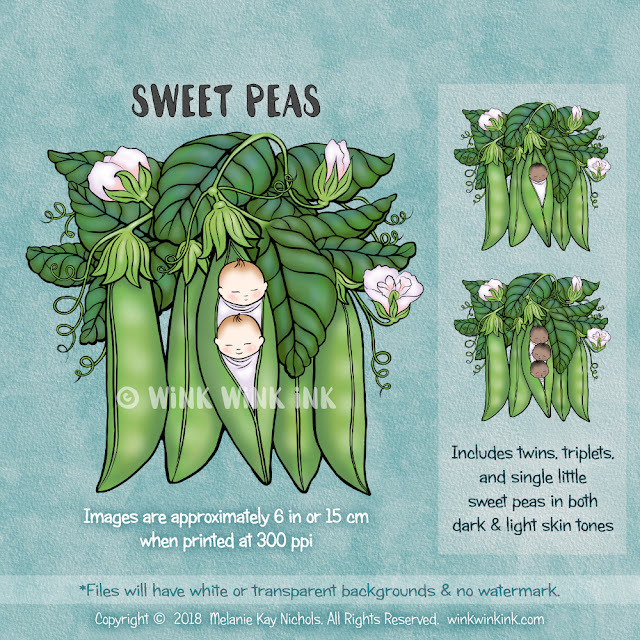 I am very excited to announce my newest set of images, "Sweet Peas"! Having twin grandbabies has made me realize that there is not a lot in the way of images for twins. I had so much fun making this image that I made single and triplet Sweet Peas too! And the colored versions include dark skinned and light skinned babies. If you need an image for baby cards, I think this set is going to give you a lot of bang for your buck! So click HERE to check out "Sweet Peas" ! My daughter informed me some time ago that I NEED a narwhal image in my store and I made this for her. 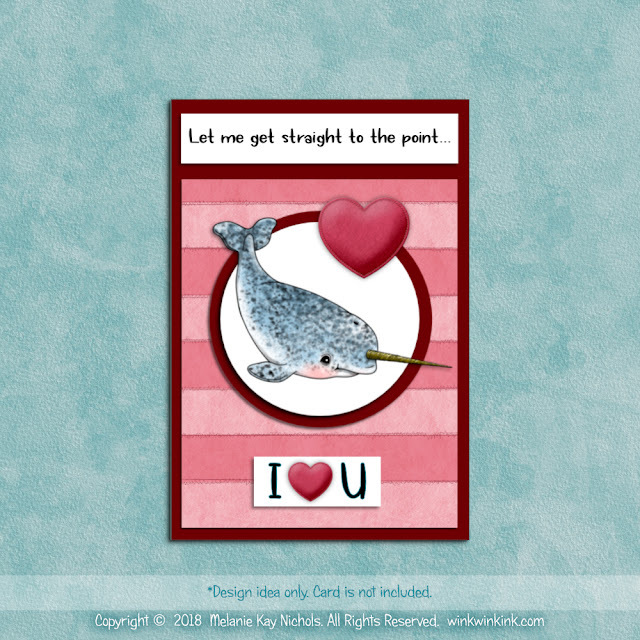 There is a sea of other narwhals to choose from out there (pun intended!) and he has such an original name, "Narwhal", but I hope this little guy has that special something that somebody is looking for so he doesn't get lost in the crowd, or pod. A crowd of whales is a pod. LOL Anyway, I had so much fun making him, I'm not sure why I haven't done more sea life. I might have to change that! Here is one example of the kinds of projects I'm working on for each image listing and this one is just in time for Valentine's Day! 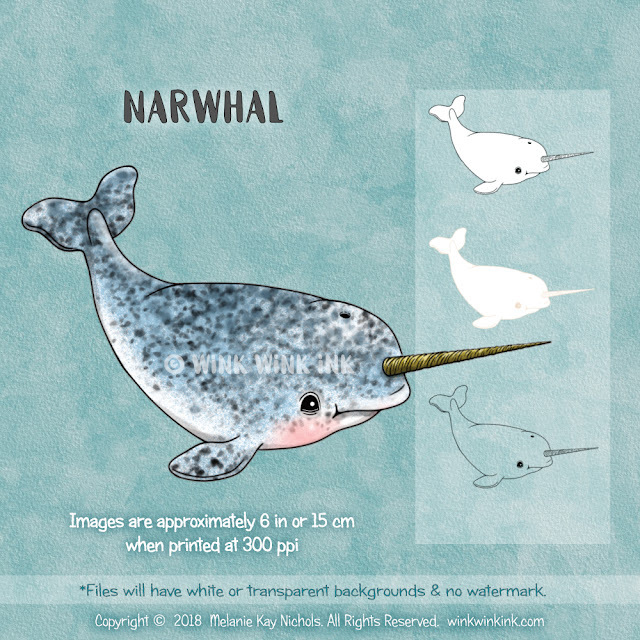 Click HERE to got to my "Narwhal" listing! Finally, I just want to thank all my customers, old and new, who continue to support me even though my little art hobby takes a backseat to "life" more often than not. All of you who send me kind emails and check up on me totally make my day! Thank you! I'm looking forward to a great 2019 with you all! Copyright © 2019 Wink Wink Ink. All rights reserved.